For the past 20+ years the Center for Systematic Entomology (CSE) has served as a non-profit corporation designed to further systematics in its broadest sense. It has supported the Florida State Collection of Arthropods (FSCA) in many ways, including purchase of computer software, library materials, museum study trips, and labor for bulk sample sorting. The CSE has also provided a number of grants for specialists to study at the FSCA. Because the Research Associate program supports insect systematics in many of the same ways, we believe that membership in CSE provides another way that Research Associates can assist. 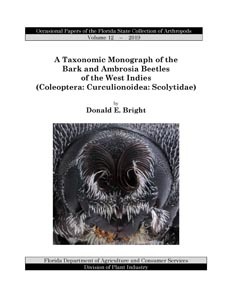 Publications of the CSE includes a newsletter (discontinued after 2003), the journal Insecta Mundi, devoted exclusively to arthropod systematics, as well as the Memoirs Series. One of the advantages of membership is publishing in the journal without page charges. We urge all Research Associates to support the CSE and simultaneously support FSCA and its various systematics projects. For $40 you can be an important part of this effort. The CSE bylaws were last updated December 21, 2006.